The Keefer Mansion Inn is revamping its menu to give guests a dining experience that’s unparalleled in Niagara. 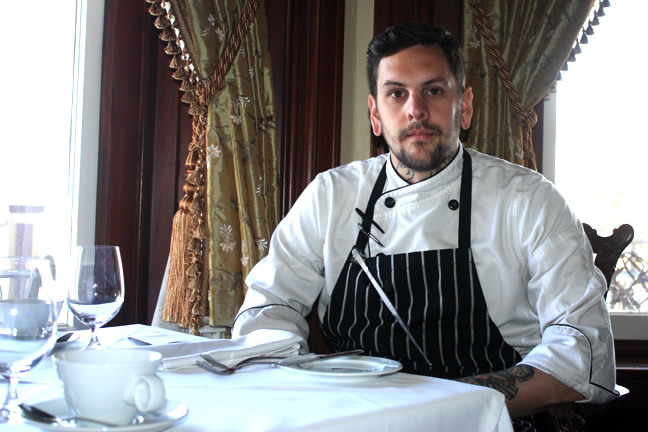 Newly hired executive chef Kyle Paton was brought on board to take the historic bed and breakfast’s already stellar reputation as a culinary destination to a new level. "They wanted to elevate their food, and make dining here an experience like nothing else in the area,” said Paton, adding he jumped at the opportunity to join an established business that is striving to revamp its culinary brand. Each meal is crafted with care and passion for feeding guests high quality dishes. His own food philosophy is shaped by his belief in sustainability and respect for ingredients. "A huge focus of mine is sustainability, and I thought that this played well with my food politics. I wanted to stay away from the over-farmed and poorly raised typical meats that you see at every restaurant,” he said. Nutrition and functional foods have been a focal point of Paton’s career. "That all comes back to respect for ingredients, and loving vegetables for me,” he said, adding he focuses on crafting dishes that incorporate vegetables as much as meat. Taking an "old world approach” with ingredients and infusing modern techniques into the mix is setting the Keefer apart and bringing their fine dining to a new level. You’ll see heritage birds, venison, lamb and boar on the menu. The 9,000 square-foot Keefer Mansion Inn is conveniently located at 14 St. Davids Street West in Thorold. Hugh Keefer (of the Keefer family, who are considered Thorold’s founding family) built the Maplehurst medical facility in 1886, which operated for nearly 80 years. The building was later restored and transformed into the Keefer Mansion Inn. Today, it’s designated under the Ontario Heritage Act and features a grand staircase, eight fireplaces and 12-foot ceilings. This premier events venue hosts weddings, family and corporate celebrations and is an exceptional bed and breakfast, combining Victorian elegance with 21st century luxuries. Every room is decorated with reproduction antiques to reflect the charm of ages past. The Keefers are one of Canada’s most important engineering dynasties who planned and directed the building of many railways, bridges, water and sewer works, the Welland Canal and Canada’s new Parliament (Information courtesy of The Keefer Mansion Inn).